Objective: Prevent respiratory illnesses caused by organic dust and mold. Review the information below on dust and mold hazards and ways to reduce exposure. Have workers identify the organic substances they handle and dust and mold hazards they face. Have workers discuss specific ways they can reduce exposure to dust and mold in their work. Landscaping and horticultural work often involve peat, vermiculite, perlite, and mulch. Other organic substances may be frequent as well. Those organic substances produce dust when handled. Molds often grow naturally in the substances, too. Mold spores attach themselves to airborne dust particles. All workers can be exposed to organic dust and mold. Greenhouse and nursery workers often get heavy exposure. Inhaling moldy dust from peat, vermiculite, perlite, mulch, or other substances can cause different diseases. Respiratory symptoms vary with the amount and intensity of exposure. After a first reaction, a worker is likely to develop an increased sensitivity. Then, a worker can have a more severe reaction with fewer exposures. 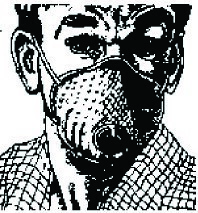 In Chronic Farmer’s Lung, the reaction continues even after all the irritant is gone. It is possible to develop Chronic Farmer’s Lung after one acute attack. However, it usually develops slowly over time after repeated exposure. Contact a doctor if concerns about permanent lung damage arise. Organic Dust Toxic Syndrome (ODTS) has similar symptoms but does not involve the immune system. Organic Dust Toxic Syndrome goes away after it runs its course. It often hits all the workers in a group at one time. Exposure to organic dust and mold can cause bronchitis and asthma. Exposure can also aggravate existing bronchitis and asthma. For more details, see the Tailgate Safety Training modules Selecting a Respirator, Pesticide Exposure, and Respirator Fit. Identify dust and mold in the work site. Heavy concentrations of mold spores appear as dry white or gray powder or clouds. Minimize the amount and type of dust and mold in your work site. Avoid exposure to dust from decayed plants, leaves, mulch, and other materials. Limit exposure to all dust and mold. Work in a controlled site whenever possible. Use mechanical controls to remove dust and mold from the air, where feasible. Move work outside whenever possible. Avoid dusty work in confined areas. Wear a particulate respirator or dust mask when working with moldy mulches. Fit-test particulate respirators and dust masks. Use exhaust fans when possible to control exposure. Seek medical advice when concerned about exposure. Know the warning signs of Farmer’s Lung. Change ventilation filters on a regular schedule.